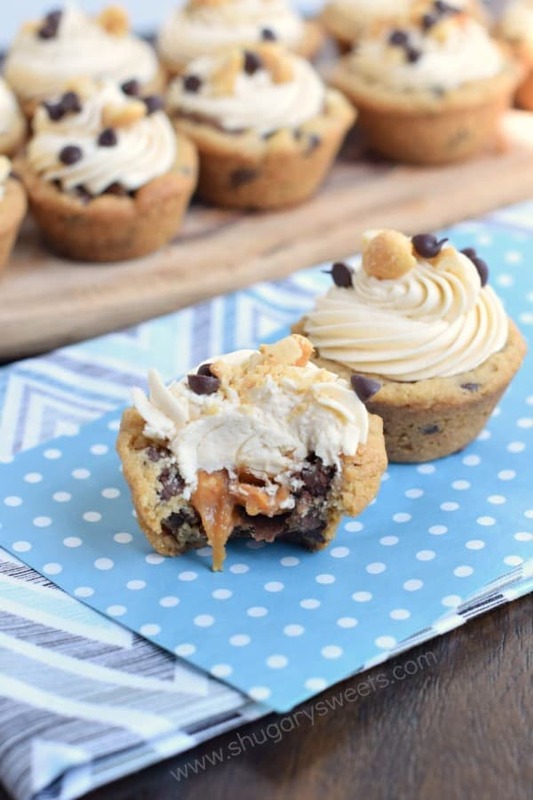 Easy Snickers Cookie Cups made with refrigerated cookie dough and candy bars. Take the extra step and make the caramel frosting, so worth it!! That’s because my arms are useless right now. Like, seriously, useless. For those of you who lift weights, you know what I’m talking about when I say it was arm day. Turning 40 (a few years ago, haha) has totally made me into this exercise crazed lady. Gone are the days of eating cookies, brownies and cake with no consequences. When my son left for boot camp, over 7 weeks ago, I vowed to myself that I would accomplish 3 pull ups by the time he returned. I have never been able to do one, unassisted, so this was a huge goal for me. I started lifting weights (more routinely than ever before) and I have been determined to get a stinking pull up on my own. At this point, I was happy to get just ONE. in our closet doorway in the bedroom, so for the past month I have been obsessed with attempting a pull up every time I walk by it! And every time, I grasp, heave, and move an inch or two up in the air. Then last week, big progress! I began getting nearly halfway up, and all of a sudden, within a few days, I did it. ONE complete pull up (and down slowly). You guys. This may not seem like a huge accomplishment to you all (some of you are probably rolling your eyes, it’s okay). But for me?? I’m so excited. So much so that I headed off the gym and swam for the first time in over 12 years. And now…I can’t move my arms. Between lifting weights and swimming, they are pretty useless today. However, if I had a plate of these Snicker’s Cookie Cups in front of me, I guarantee I would figure out a way to shove a few in my mouth. 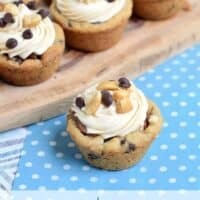 One of my husbands’ favorite treats is chocolate chip cookie cups with a Reese’s in the center. That’s it. He is even content with the refrigerated cookie dough for a simple two ingredient dessert. While I happened to have a roll of cookie dough on hand, the only candy I had was Snicker’s. And I promise I was going to stop there. 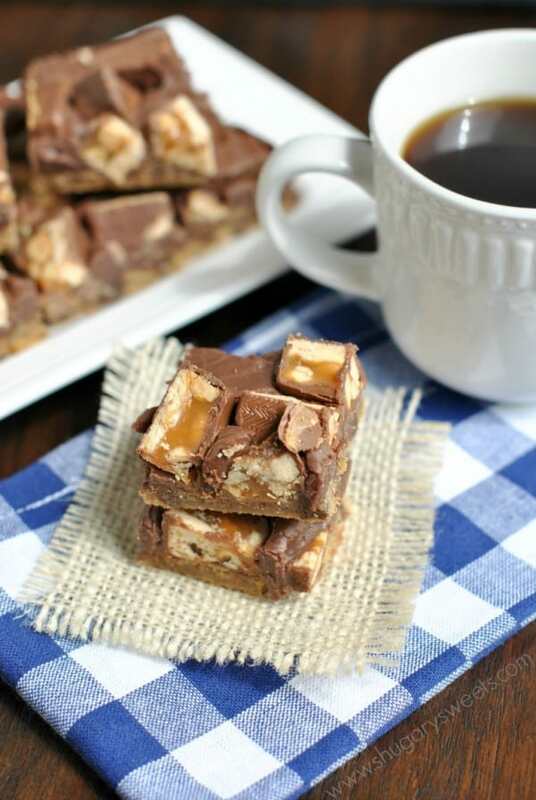 Snicker’s Cookie Bars: delicious cookie bar topped with chocolate fudge and chopped Snickers. LOVE. 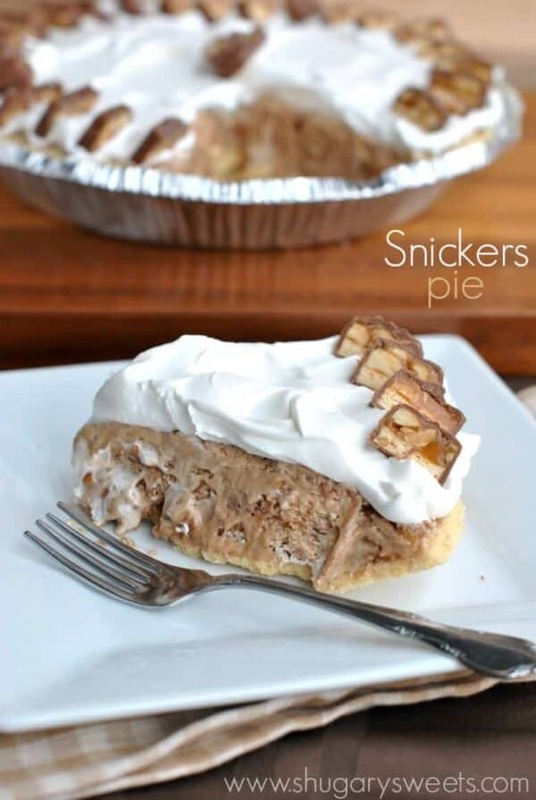 Snicker’s Pie: this dreamy pie is made from melted snicker’s bars, then frozen! YUM. 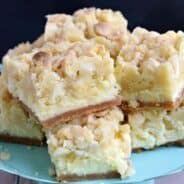 Snicker’s Taffy Apple Salad: a delicious side dish for any potluck! Cut cookie dough into 48 pieces. Drop each piece into a mini muffin tin. Bake in oven for about 10-12 minutes, until lightly browned. Immediately press candy into center. Allow to cool in pan about 15 minutes. Remove and cool completely on wire rack. For the frosting, beat powdered sugar with butter, milk and caramel sauce for 5 minutes, until light and fluffy. Pipe onto cooled cookie cups, and immediately sprinkle with peanuts and chocolate chips. 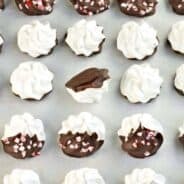 Today’s Snicker’s Cookie Cups recipe was originally published on Shugary Sweets on September 7, 2015 and has been republished in August 2018. WOW. I am totally impressed. As someone who tries to get stronger but who has a totally weak upper body, I am full of admiration. Congratulations on getting that pull-up done! And for your overenthusiastic swim. Being sore is good. It’s your body’s way of letting you know you have muscles! These cookie cups are a perfect post pull-up reward! mmm, the cookie cups look very delicious! Yay for pull up goals!! I don’t think I can even do 1. Maybe I should try sometime. Or maybe I should just eat 100 of these instead. Because snickers and cookies and adorable little cups? GIMME THAT! Pinned! You have actually combined my all time favorite candy bar into a cookie AND a cup which means = portable deliciousness. This is dangerous! These are so cute! I love the oozing caramel in the center! It is the best part. Oh wait, the frosting is good. Darn, and the cookie. How do you choose??? These look so versatile and absolutely delicious! Congrats on achieving your goal! You have the right motivation so no wonder you are rocking it! 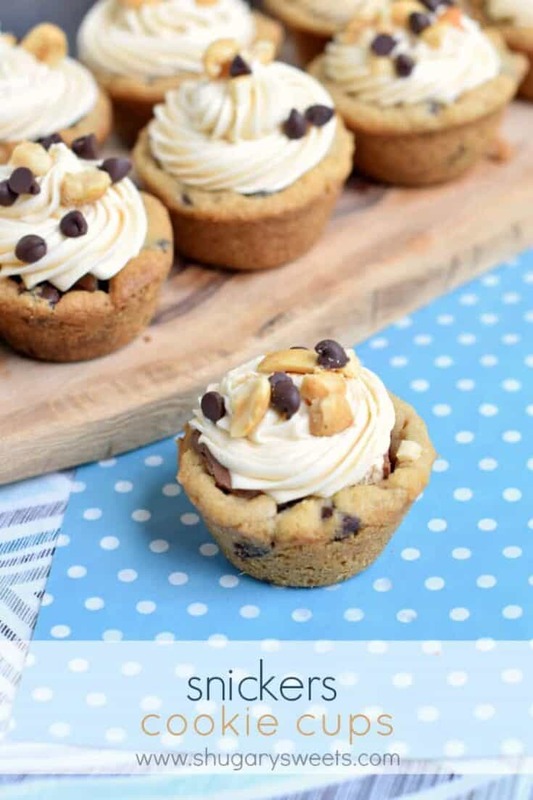 These cookie cups look so tempting! Love the caramel frosting idea! Congrats on your pull-up! That’s more than I can do – I have bird arms, haha. 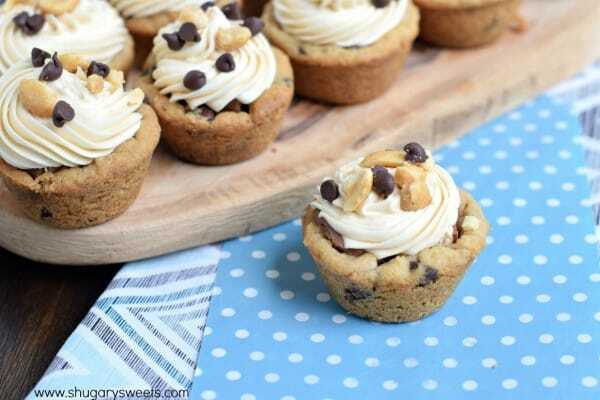 Love these cookie cups! Eeek! I am SO IN LOVE! These look absolutely INCREDIBLE Amy! You are a genius. I’m pretty sure I couldn’t do a pull up right now. Good job! leftover candy? What is that? haha!! I had the privilege of trying one of these delicious little yummies. Oh my–they are every bit as fabulous as they look. Probably even better! Made these yesterday. Oh so YUMMY! LOVE THE CARAMEL FROSTING!! We’re talking eat it with a spoon love! Of note, I used mini snickers and noticed the candy center would pull out when taking a second bite. I’ll try cutting up the full-sized bars next time, as then they are not completely enrobed in chocolate and will perhaps stay in place? Thanks for the recipe!!! Good tip on the candy bars. And yes. That frosting. SWOON!!! Hi! I love your blog and all of your recipes. I bake for the Chicago Bears, and plan to make these for the opening week of the NFL season. Just wondering about the frosting. When you say caramel sauce, do you use a homemade sauce, or store-bought like you’d put on ice-cream… or just any kind will do? Thanks so much for sharing all of your fabulous treat recipes! 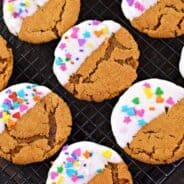 I am going to start blogging my baking and will link to you whenever I make yours. Can’t wait to try these! Hi Sarah, what a fun job (especially for a Bears fan like myself 🙂 ), for the caramel I usually use a homemade…but a thick store bought works great too!! Good luck with the blog! Made these for weekend family party easy to put together yummy thanks for a great recipe!